Available from May to October – Located on the beautiful south east coast of Rhodes, the Pefkos Garden Hotel occupies an elevated position on the edge of the cosmopolitan town of Pefkos. The stunning local beach is just 300 metres away and there is a great selection of bars, restaurants and shops in the local area. The centre of Pefkos is just 15 minutes away. 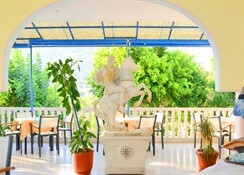 The Pefkos Garden Hotel has a brand new mini club with plenty of activities for children. The hotel will appeal to families and couples looking for pleasant, comfortable accommodation in fantastic part of the island very close to the beach and local amenities. 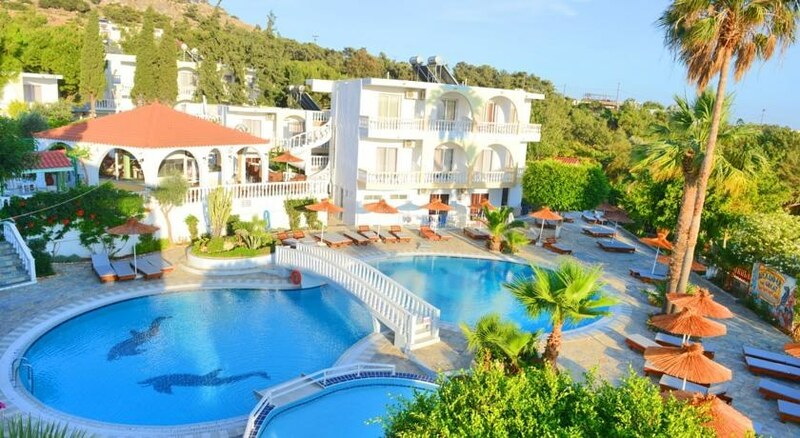 Facilities include reception with currency exchange and safety deposit box rental, an outdoor swimming pool, childrens pool, sun terrace with complimentary loungers and umbrellas, pool snack bar and a restaurant. Further facilities include table tennis, pool tables, electronic games, internet corner, daytime and evening entertainment programme for adults and children. All 93 rooms are in Rhodes at Pefkos Garden Hotel also provide, satellite TV, Fridge, Direct phone call service and Wake up call service. Restaurant by the pool is at your disposal all day long, so that you taste local and international dishes. And there is no time to get bored! We are always happy to offer you any kind of entertainment: Satellite TV, Table Tennis, Pool Tables, Electronic Games, Darts, Internet point, Mini-club and Kindergarden are at your disposal. The night is coming... Join us for Karaoke, Greek Night and BBQ. Guests may choose to take the All Inclusive option that includes breakfast served from 7am to 10am, hot and cold drinks and snacks between 11am and midday, lunch from 12.30pm to 2pm with complimentary drinks, and dinner between 7pm and 9pm also with complimentary drinks. From midday to midnight, locally sources alcoholic and non-alcoholic drinks are available. 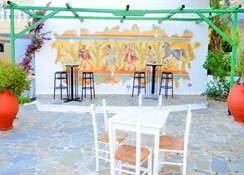 Set on a slight hillside on the outskirts of Pefkos with the nearest sandy beach just 300 metres away. A selection of bars, shops and restaurants are all to be found within walking distance and the centre of Pefkos is just a 15 minute walk away. Lindos town is 5km away with Rhodes town 59km away. A regular public bus service to both Lindos and Rhodes can be found nearby. Rhodes Airport is approx 55km away.